GEORGETOWN, Texas -- With 54 holes, there is plenty of golf to go around for residents of Sun City Texas, a Del Webb master-planned community located in Georgetown just northwest of Austin. 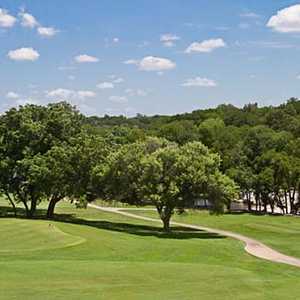 Cowan Creek is the newest of three 18-hole courses at Sun City Texas northwest of Austin. But you don't have to reside in Sun City to play the courses, and you don't have to be retiree-aged to get a great test of golf, either. While it's true that residents get first pick of times, the general public can find their fill of tee times. Truth is, prime time at the Sun City courses is on weekday mornings -- and not so much on the weekends, when other area courses are booked solid. Afternoons are a particularly good time for the public to come out. For those after a quick round, it's often quite easy to get in 18 holes in three hours on wide-open fairways on any of the three courses. Multi-course facilities are all over central Texas, and Sun City's operation certainly holds its own with any of them, even though all three courses have their own clubhouse and are singular experiences. Sun City's plan calls for 18 holes golf per every 2,500 homes. With a build currently at 7,500 (once planned for as many as 10,000), that means three courses service a community filled with golf enthusiasts, plus many more in the surrounding area. Before you think the courses are designed primarily for dew sweepers playing off the senior tees, note that each course has a championship-caliber back tee yardage around 7,000 yards and slope/rating as stiff as most of the area's best courses. Bunkers often come with high lips and there are plenty of holes where big swingers off the tee are rewarded. The large greens are also particularly fun to take on; Cowan Creek and Legacy Hills have smooth, Miniverde Bermuda greens, while White Wing uses TifEagle Bermuda. So with three golf courses at Sun City, the question is, where should you begin? 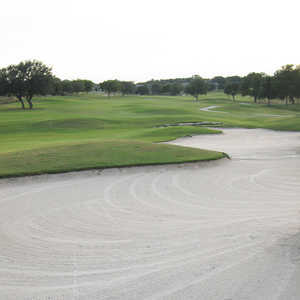 The original course at Sun City Texas, Legacy Hills Golf Club debuted in 1996 and features a pleasant, gently undulating layout through creeks, cedar, oak and pecan trees. Designed by Billy Casper and Greg Nash, greens average more than 8,000 square feet in size, and the back tees play more than 7,000 yards. While the practice area is good and the clubhouse has a banquet area, there isn't more than a vending machine for snacks and drinks, so fuel up in advance. Despite the fact Legacy Hills is set in the heart of the community, playing corridors are generally very wide, with plenty of trees between fairways and houses, so the course feels far more secluded than it actually is. 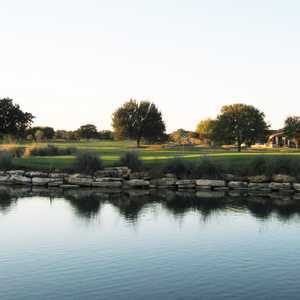 Cowan Creek Golf Course, which opened in 2008, is one of the newest courses in central Texas. Unlike Legacy Hills and White Wing, the Gary Stephenson-designed Cowan Creek escapes the trees for a more wide-open layout that calls for a little more wind control, though greens and fairways are a bit larger to account for it. Perhaps the most exciting hole in all of Sun City is the risk-reward, par-4 14th that has creeks lined with rock walls and waterfalls and begs for big hitters to take the shortcut over water to reach the green. With the largest clubhouse of the three (though to be fair, the pro shop is small and there is no consistent food and beverage for guests), it also has the best practice facility at Sun City. White Wing Golf Club edges out the other two courses, according to GolfNow users' ratings on the three courses at Sun City, with a 4.3/5.0 rating. (As of mid-April 2013, Cowan Creek is at 4.2 and Legacy Hills is at 4.1, so the difference is rather negligible). Casper and Nash added White Wing shortly after Legacy Hills in 1998 and the course has a similar wooded setting. Erik Beyer, the head professional at Sun City, says based on member comments, White Wing is the toughest, thanks in part to trees that often pinch fairways enough to have to hit over or around them on approach shots if your drive doesn't find the right line. What sets White Wing apart is that it has the best food-and-beverage operation at Cafe on the Green, a restaurant and bar with both indoor and outdoor seating. Even if you don't play the golf course, you can stop by after your round for happy hour or dinner on the patio.